The all-new City Concours, kicking off in London from 8-9 June, will be hosting a number of incredible cars for sale from some of the world’s top automotive specialists. For two days only, it’s your chance to not only see a carefully curated collection of more than 100 rare cars in the heart of the City, but also to drive away in one of your very own. 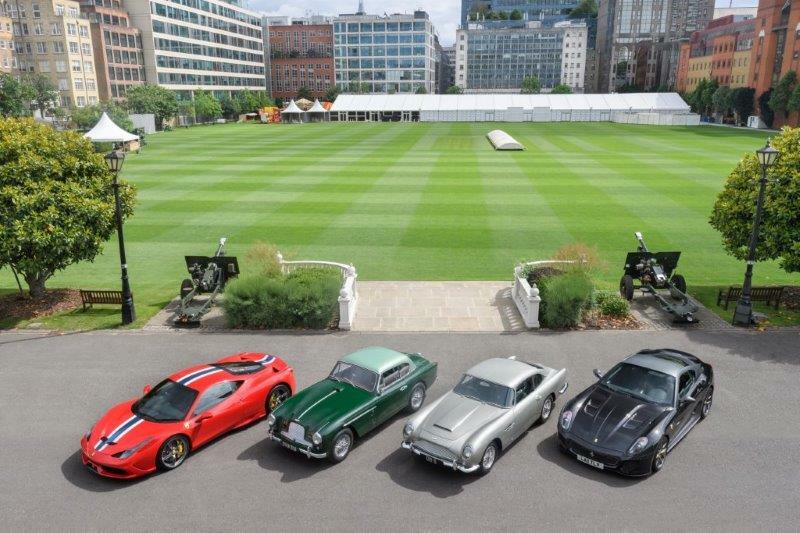 Just a week before the City Concours opens, a number of the event’s automotive partners gathered some of their models together at the venue – London’s Honourable Artillery Company. Providing a glimpse of the kind of exotic cars set to roar into the City of London, were models from JD Classics, Nicholas Mee, Romans International and Fiskens. London-based Aston Martin-appointed Heritage experts, Nicholas Mee, provided a gorgeous Aston Martin DB2/4 MK II Fixed Head Coupé. Fitted with a 3.7-litre engine and four-speed gearbox similar to that found in the DB4, it boasts performance levels above and beyond a standard DB2. Joining the DB2 at City Concours will be a 1972 Aston Martin V8. JD Classics, world-famous classic car specialists, provided an impeccable Aston Martin DB5 with a unique secret. Used by Ogle Design Ltd as a prototype to showcase the forthcoming DB6 interior it features a number of special interior touches not found on any other DB5. JD Classics will also be showcasing a Ferrari 599 SA Aperta and a Mercedes 300SL at the show. From the more modern end of the spectrum, Romans International will be showcasing a 458 Speciale, built to an extremely limited production run. The most extreme iteration of the the 458 range, this Rosso Corsa example comes with the optional Blu Nart Racing Stripe and titanium exhaust system. Also on Romans International’s stand will be a 458 Speciale A, alongside two other ultra-rare modern Ferraris. Another ultra-rare modern Ferrari came courtesy of Fiskens, with the 599 GTO. Just 599 were made, with Ferrari saying on its release that it was the most extreme sports car the marque had ever produced. Noted for its sales of the most important vintage, classic and competition cars, Fiskens is also displaying an Aston Martin DB6 Volante and Bentley 4.5-litre ‘Short chassis’. City Concours’ other car partners, including Atalanta Motors, Clayton Classics, H.R. Owen, Stratstone of Mayfair and Will Stone Historic Cars will also be showcasing some of their latest incredible cars for sale. Among those cars forming part of the City Concours’ curated display are more than 70 of the world’s rarest and most amazing cars and motorbikes. From the Maserati Tipo 200SI and Jaguar D-Type to the Bugatti Veyron and McLaren P1, visitors will have the chance to see the most amazing cars ever built in the metal. The City Concours will be held from 8-9 June at the Honourable Artillery Company grounds, near to Liverpool Street and Moorgate stations. Tickets to the City Concours are available now from www.cityconcours.co.uk. Hospitality, including breakfast and lunch packages, are available from Rachel Roullier; you can contact her by email rachel@thoroughevents.co.uk or call her on 07826 907 121.